No article last week because I bought the new God of War game and…well, not much else got done. I managed to play most of my event games, but I didn’t have any time to write. Well, I did, but nothing could tear me away from God of War. This was the greediest of all of my potential builds, but certainly the most powerful by far. It had a fantastic curve, and the top-end was loaded with incredible value. There were still some fairly mediocre cards in a sealed format. Minotaur Oathkeeper isn’t that useful when your units are either 2/1s or huge. Soaring Guard was solid for triggering Valkyrie Ally, but that was about it. I didn’t even have any relic weapons for which he could get value. Ironclad Oath is an okay trick, and something that this deck actually needed, on account of its lack of removal. Still, having to leave up 4 power to play it on defense was a big risk. If my opponent didn’t walk into it, I felt real dumb. On the flipside, it was an excellent finisher in close games. And nobody expected the second one. Crownwatch Longsword was also pretty mediocre. I usually like a few weapons in sealed, simply because your opponent won’t have many ways to blow you out. However, this deck did not have any issues punching through. I was more concerned with gumming up the ground until my bombs could take over, and Longsword is a risky play in that respect. Weapons are way less powerful on defense. 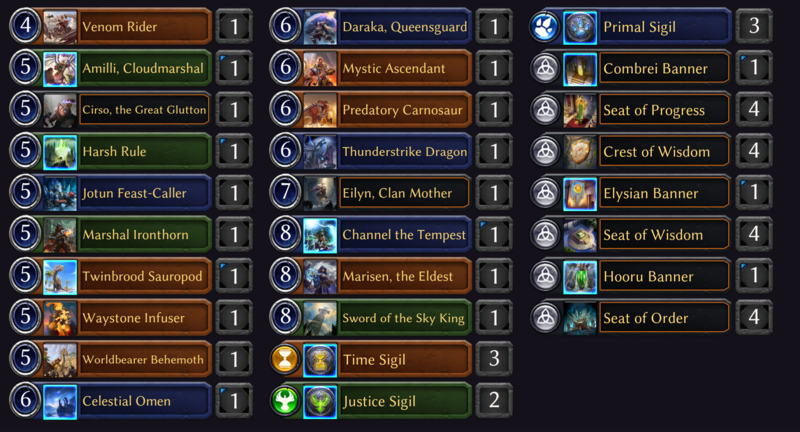 Skycrag Stranger was the unsung hero of the deck, the glue that held my ambitious powerbase together. 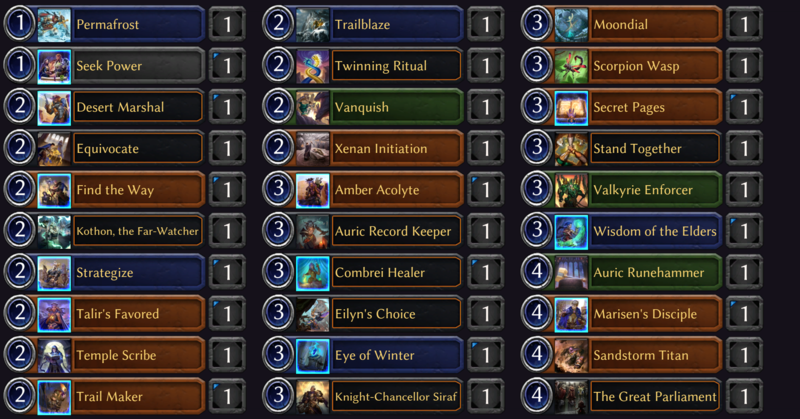 Pteriax Hatchling proved itself worthy of the splash, and Crownwatch Quartermaster was as absurd as predicted. I played very conservative with him, running out just about every other threat into my opponent’s silences and removal, and I was rewarded handsomely when they ran out of gas and I gave my random 2/2 +4/+4 every turn until they died. Refresh was also incredible. When Set 1 was the draft format and you saw a lot more Refreshes, it was easy to get flooded on them. Because it doesn’t buff attack, you certainly don’t want too many, but in this deck, which only wants to hold the fort until it’s bomb time, it was the perfect trick. I ate a lot of combat tricks with it and had a brick wall of a blocker leftover afterward. A 9-1 record is a fantastic start to the league. It definitely made me eager to play out all my tiebreaks, as I have a legitimate shot at a top finish with that kind of start. The tiebreakers didn’t go quite as well. I had some power-screw issues that didn’t crop up during the ranked matches. I definitely feel like 13-7 was a bit underperforming for the deck, but then 9-1 was probably a bit better than I deserved, so I’m glad it worked out in the order it did! Interestingly, I started last month’s league 22-8 as well, but I did it in the wrong order, going 5-5, then 17-3 in tiebreaks. The order of your wins matters! I kind of hate that, especially since it’s not like we get Swiss pairings, but what can ya do? How ’bout those rares? Barf. Not getting any help there. Not getting a ton of help in general. The quality of these packs is very, very low. The only not-completely-meh cards are the Trail Maker and the Into the Furnace. The latter isn’t on my radar at all, as Fire is simply a splash, and I have no Grenadin to even make it do 4. Trial Maker, on the other hand, is excactly what the doctor ordered. It really smooths out my greedy 4-faction power base, ramps me to my bombs, and even happens to be an explorer for my sentinel friend. Amber Waystone is another obvious inclusion, though it is probably rare that I’ll make it to TTTT. Doesn’t cost me anything to play it, though. 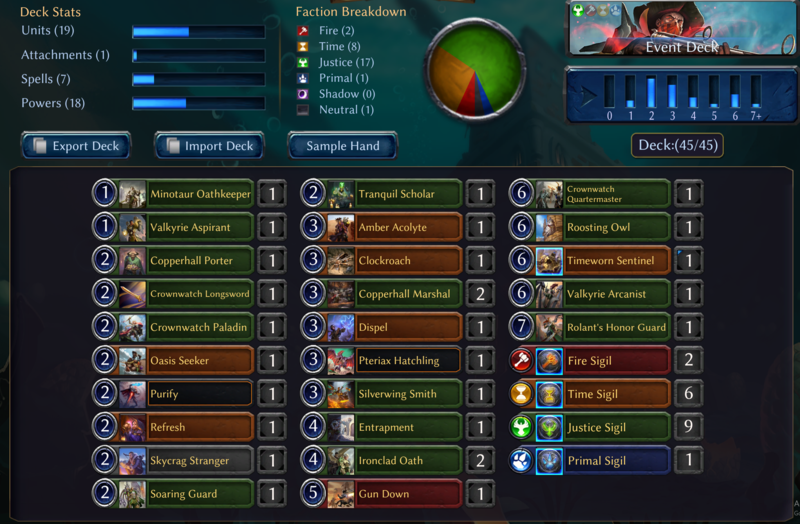 Silverwing Smith and Copperhall Marshal are both playable cards, but I’m pretty full on 3s, and I certainly don’t need a third Marshal in my 1-ish weapon deck (I do have Arcanist, technically). Silverwing Smith does help trigger my Crownwatch Quartermaster, and it’s a nice flying body to buff with the ability, but it’s nothing too thrilling. Not a huge upgrade by any means, but hey, it worked last week, right? I did not get to finish all of the tiebreakers because I waited until the night before the reset…and then my internet died. Classic Alaskan stuff. Unfortunate that it cost me some potential tiebreaker wins, but I’m satisfied with where I ended up. At 17-3, with 22 tiebreaker wins, I was sitting in 20th place before the reset. Trail Maker was as good as I hoped, and the deck felt a great deal more consistent in its power development. There aren’t many other comments to make on how the deck played out, seeing as I didn’t change much. Here’s to opening better packs next week! Even with the mediocre opens in pack 2, I was roughly 20th at the end of Week 2, which leaves me within striking distance of the top. Unfortunately, missing those few tiebreaker wins may come back to bite me, as I only have 22 despite my stellar 17-3 record in ranked matches. I went 3-3, 7-2, 7-1, 7-1, 3-3, for a combined total of 27-10 with this pile of goodstuff, which was good enough for a 59th-place finish. My theory in deckbuilding was fairly simple: People can only run a single copy of each of the good removal spells, but I can run a whole lot more beefy threats than that. When it comes right down to it, an unanswered Amilli is effectively the same thing as an unanswered Cirso, which is the same thing as an unanswered Worldbearer Behemoth, and so on. The gap between those cards and the role they play in the game is fairly small, whereas the gap between Vanquish and the next-best thing is massive. Unsuspecting all-stars were Marisen, the Eldest and Moondial. Yeah, I won games on the back of Mystic Ascendant or Predatory Carnosaur, but we knew how good those cards were already. Marisen, though, was absolutely insane. The sheer threat density of my deck meant that my opponent soon ran out of removal. In the mirror matches, where my opponent was putting my removal under similar pressure and boards were stalling out, Marisen just went far over the top of anything they could do. Moondial was a similarly fantastic answer to stalled boards. Interestingly, pretty much every Time deck I played against had a Moondial, but I did not see a single other Marisen. I’m pretty sure the power base was a hot mess, but between the Time fixers and the Primal card draw spells, I managed to get there more often than not. It may be correct to cut Amilli for something else because there were a lot of games where I didn’t quite get to JJJ. Other cards I wasn’t sure about were Twinning Ritual and Trailblaze. With Trailblaze, I figured hey, a bit more consistency, but when the games actually played out, it didn’t feel very impactful, and I would almost always have rather spent my power doing something more productive. Twinning Ritual wound up being pretty good. Again, the theory behind the deck was to overwhelm my opponent’s answers with big threats. That meant I had a dearth of cheap things to do, as well as some of the best possible card quality. Combine that, season with a few Echo cards and I figured it was worth a shot. It performed decently well, but I’m still not sure if it was overall correct to run. Channel the Tempest was also excessively greedy, but good luck getting me to not play that card.